Seriously New England? You just like to mess with us, don't you? Yesterday the high was 68°F and the low was 42°F. So, of course, tomorrow just subtract about 30 degrees. Yup, they predict the high is going to be 38°F with a low of 16°F. Well, with a forecast like that I guess it's still completely appropriate to share a recipe for a comforting bowl of hot oatmeal. This bright bowl of goodness definitely helps get us going on a cold morning. I cannot help but revel in the color of this oatmeal. I mean, just look at it. Pow! That glorious yellow color is all thanks to turmeric and something called golden milk. Golden milk is one of those trendy things in the food blog world. However, it’s not really a new creation. It comes from Ayurvedic practices, an ancient branch of medicine in India. It’s a tonic made with milk, turmeric, and other warming spices like cinnamon. 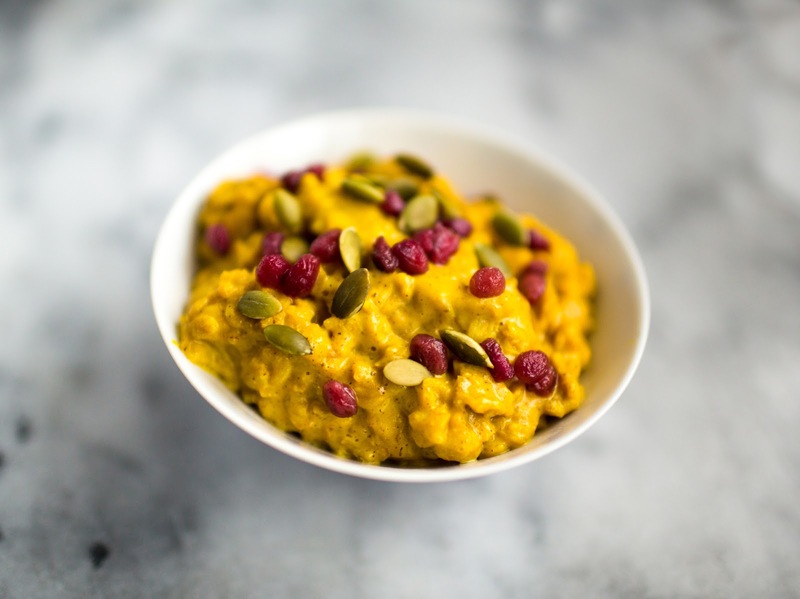 I know I've sung the praises of turmeric on this blog before (here and here) but a little refresher is a good thing. Turmeric is known for its anti-inflammatory properties. Among its many reported health benefits, turmeric is said to boost immunity, promote digestive health, and help maintain cholesterol levels. Primarily thanks to turmeric, golden milk is a traditional home remedy for coughs, colds, and sinus headaches. 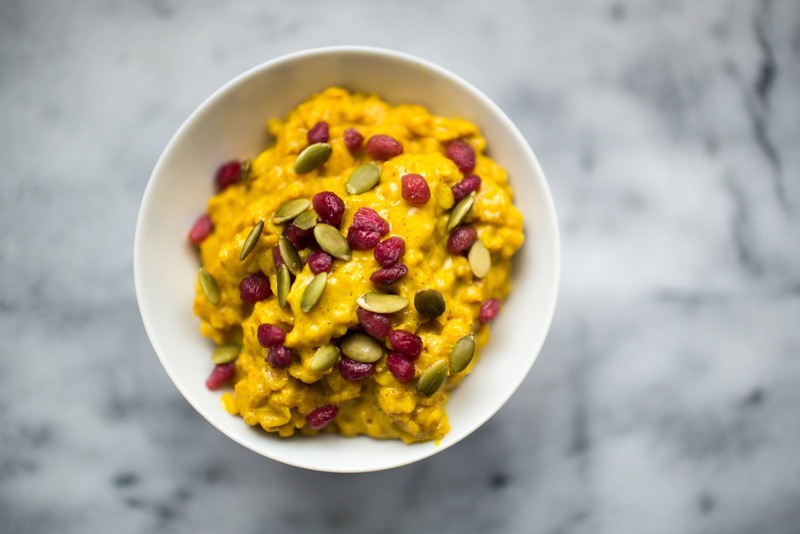 Golden milk is a soothing and delicious drink on its own, but it adds a whole new dimension in terms of color and comfort to your traditional morning oatmeal. The color alone helps wake up the senses, but so do the bold and earthy spices. If you find the turmeric taste too overpowering, I suggest adding more honey for additional sweetness. I used regular cow's milk but I encourage you to use whatever milk (coconut, nut, hemp, rice, etc.) that you prefer to drink. And, if you’re feeling a touch adventurous, add a pinch of ground black pepper when you add the other spices. The black pepper reportedly helps the body absorb more of turmeric’s healthy antioxidants. In a saucepan whisk together the milk, honey, turmeric, cinnamon and ginger over medium heat. Add the oats and reduce heat to low. Cook, stirring occasionally until the oats are tender and the liquid is absorbed about 10 to 25 minutes. Ladle the oatmeal into two bowls. Top each serving with a teaspoon of pomegranate kernels and a teaspoon of pepitas.